From 65 to 95 € the night I book ! An old farmhouse renovated with great respect for green issues (Ecogîte label). 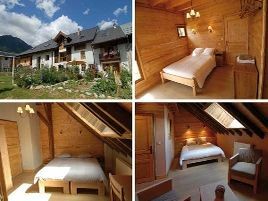 Spacious and comfortable rooms, very attractively decorated in the chalet style of the house with lots of wood, white-washed walls and natural soft tones. Breakfast with organic products and guest meals featuring savoyarde specialties and vegetarian options. Warm and friendly welcome. An excellent address!. - sur place, séjours randonnées pédestres ou peinture sur bois. - accueil de séminaires. - golf de Giez à 12 km. - ski de piste aux Saisies (20 km) ou Valmorel (25 km). - ski de fond à Seythenex, 6 km. 1 suite and 4 rooms with shower and WC. 69 euros (1 or 2 pers. ), 79 euros (3 pers. ), 95 euros (4 pers.). Extra bed 10 euros. Baby equipment, baby sitting, games, children's meals. For teenagers: hiking, table tennis, ice skating, cinema, rock climbing. Family suite. The closest station is Albertville, located at 2 km. The closest airport is Lyon St-Exupéry, to 100 km.